Cwrs Sylfaen is a foundation level course for adults learning Welsh. Cwrs Sylfaen for iOS and Android helps learners to extend their skills from the beginners level, Cwrs Mynediad. The App contains both North and South Welsh content. This foundation course from WJEC is now available to use anywhere. 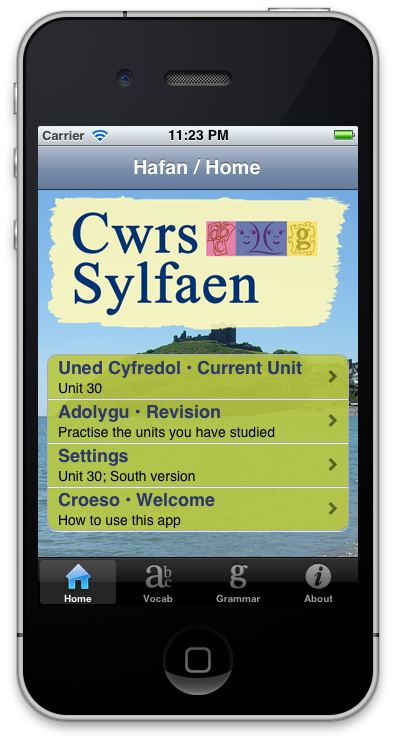 Aberystwyth University and WJEC have brought the 30 units from the popular course book Cwrs Sylfaen to the iPhone and Android. The App contains 30 expertly designed units including discussing things that you have done, expressing an opinion, discussing the news, understanding telephone messages, making plans and saying what you would do. Cwrs Sylfaen includes new patterns, vocabulary, exercises and dialogues. The Welsh audio examples and exercises will help you to improve your pronunciation so that you are clearly understood.